Neural crest cells are an important class of multipotent stem cells, generating highly diverse derivatives. Understanding the gene regulatory networks underlying this process is of great interest, but the highly migratory and thus widely dispersed nature of the differentiating cells makes isolation of cells difficult. 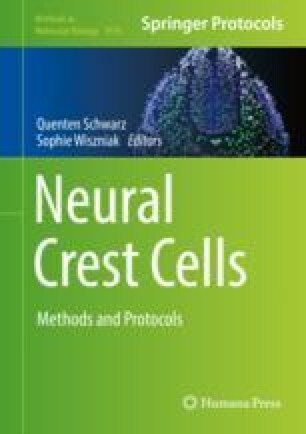 Fluorescence-activated cell sorting (FACS) of transgenically labelled neural crest-derived cells after disaggregation of embryos is well-suited to purifying these cells. However, their diverse differentiation means that transcriptional analysis at single cell resolution is necessary to dissect the gene regulatory networks at play. NanoString technology provides a method for highly sensitive, quantitative transcriptional profiling for a pre-defined set of genes of interest. Here we provide a detailed protocol for FACS purification of neural crest-derived cells, sorted as single cells into a multi-well plate, and their subsequent NanoString profiling, using a predetermined gene set focused on pigment cells. This work was supported by the grant from the BBSRC, reference number BB/L00769X/1.